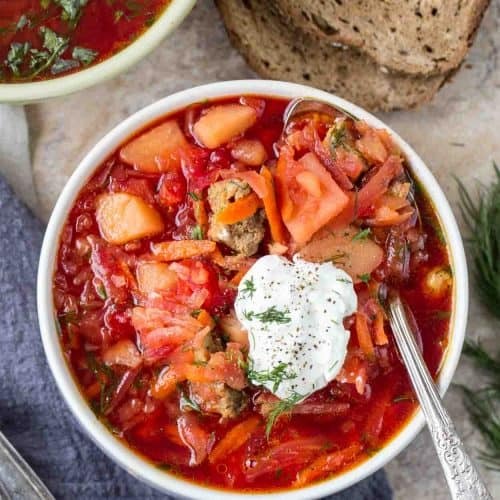 This Russian Borscht Recipe is a traditional Ukrainian/Russian red borscht soup loaded with meat, potatoes, vegetables, cabbage and beets. This hearty soup is so healthy and all the vegetables come together and taste wonderful. 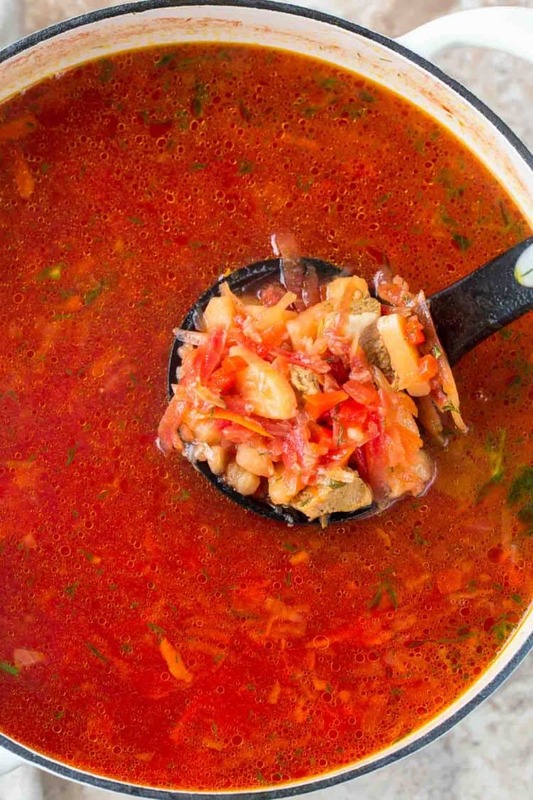 In most Slavic homes, this soup is served on a regular basis and for a good reason – it’s phenomenal. Borscht is probably one of the most popular and staple dishes in the Ukrainian and Russian cuisine. 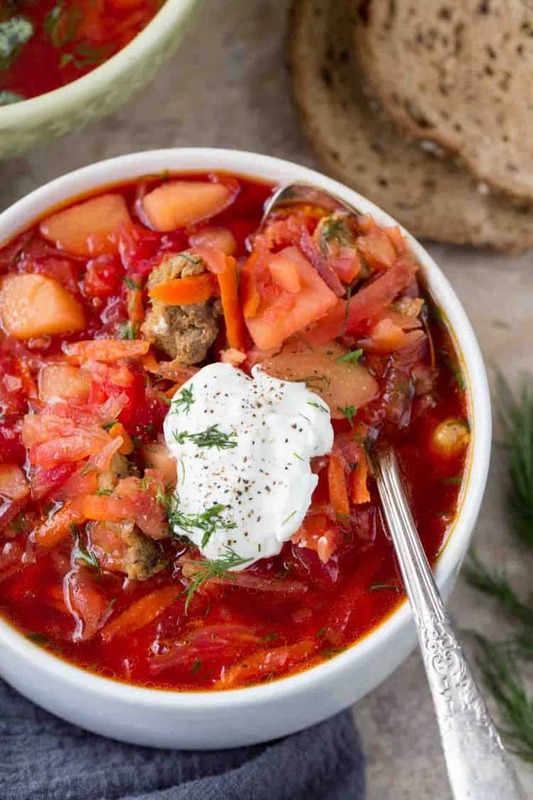 There are so many different variations of borscht recipes and all terrific in their own way. 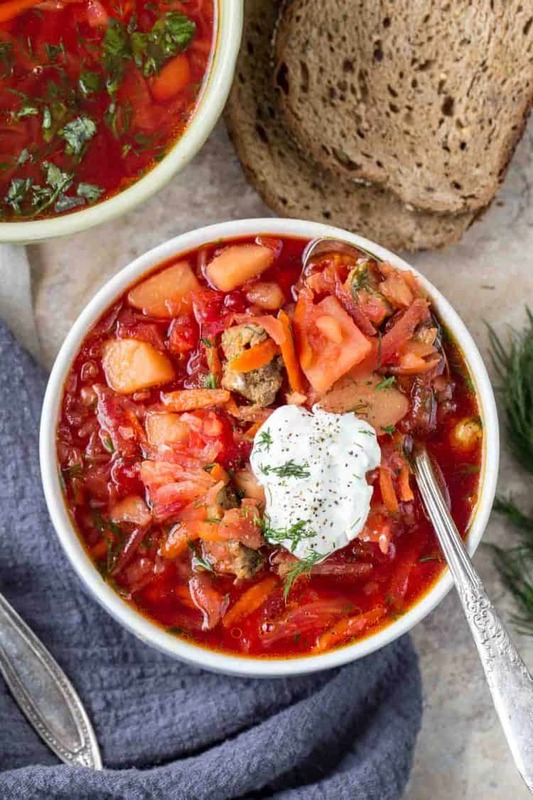 The combination of ingredients in red borscht are so unique. Fresh shredded cabbage, meat, potatoes, beets with vegetables and herbs combined is Ukrainian comfort food defined! 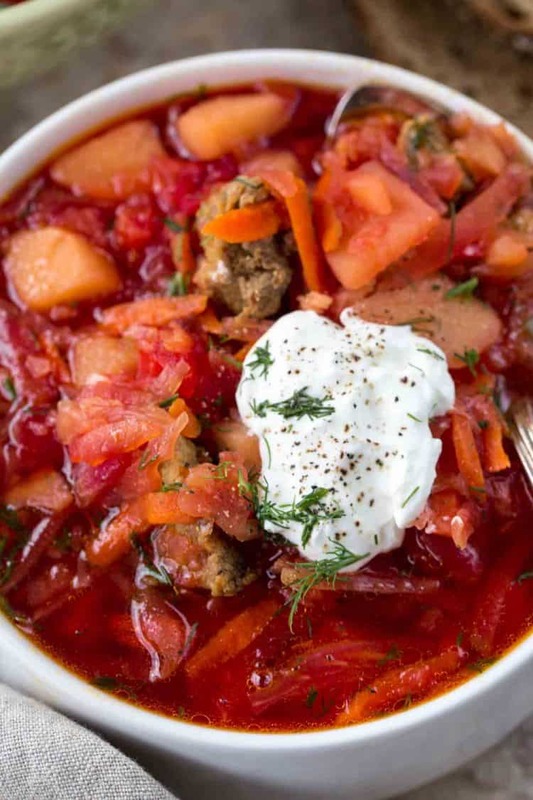 The uniqueness of this Borscht is that the meat is seasoned and becomes so tender, flavorful and melts in your mouth. Once you try seasoning the meat, you’ll never want unseasoned meat in your soup again. Seasoning the meat with garlic, bay leaves, salt and pepper just adds so much flavor to the meat itself but also the soup. TIP: You want to season the meat at least one day in advance. Rinse the meat before adding to the soup to remove the bay leaves and garlic. Most cooks add kidney beans to their red borscht but my husband and the kids strongly dislike them, therefore, we leave them out. If you are a fan of kidney beans, add them to your soup. Be sure the potatoes are all cut into even pieces or they will be unevenly cooked. You can leave out the meat if you are looking for a vegetarian soup recipe. Use a SLICER for the cabbage, it’s much easier shredding this way. Be sure to continue removing scum and fat that rises to the top until nothing floats to top when cooking the meat. Red Ukrainian Borscht tastes even better the following day when reheated. Make a large pot and enjoy the soup all week long (keep refrigerated). What kind of meat to use for Borscht? You can use your favorite meat for borscht. In classic Red Borscht recipes, the beef or pork has a bone on it. You can either add meat with or without bones. My family loves chicken most so that is what we use most often. Can I use canned beets? Yes, you can substitute canned beets for fresh beets. Keep the juices of the canned beets as well. 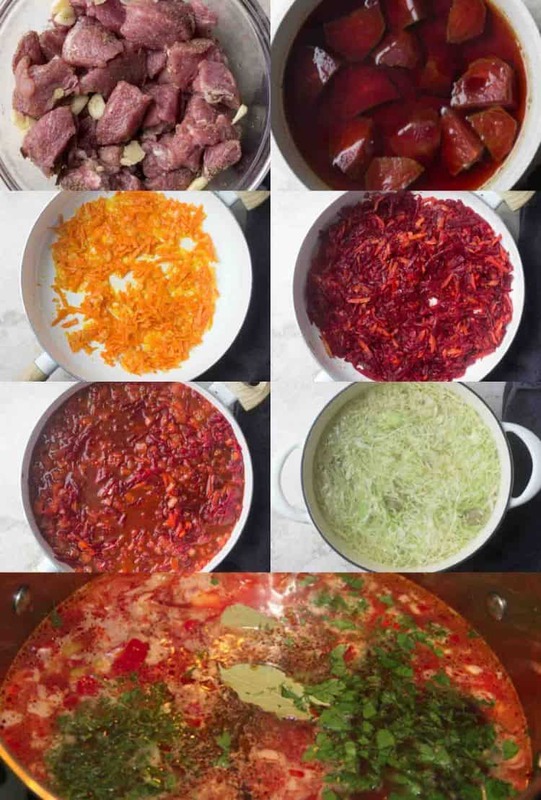 Russian Borscht recipe with meat. potatoes, carrots, cabbage and beets. Seasoned meat gives the soup so much flavor and is an amazing addition to the traditional recipe. Cut meat into bite-size pieces. Slice the garlic cloves. Break the bay leaves into smaller pieces. Season the meat. Combine everything. Refrigerate meat for at least 2 days. Peel and quarter beets. Add beets and 5 cups water to a saucepan, bring to a boil. Cook 20-25 minutes, until beets pierce easily with a knife. Once cooked, remove them from water and setaside cool. KEEP WATER. In a large pot, bring 14 cups water to a boil. Rinse seasoning off of meat. Add the meat to the boiling water. Remove scum and fat that accumulates and floats to the top of the water. It’s very important to keep removing the scum frequently. Turn heat down to low/medium, cook meat about 35-40 minutes or until meat is tender. While meat is cooking, peel and cube the potatoes. Add to a bowl and cover with cold water so they don’t turn color. Set aside. Chop the onion finely. Add to a large skillet with 2 Tbsp butter and saute 3 minutes on medium heat. While onion is cooking, grate carrots. Take the cooled beets and grate them. Add to the skillet with onion and carrots. Cube red pepper or cut into small thin strips add to skillet. Add minced garlic to skillet. Chop tomatoes and add to the skillet. Add the water leftover from cooking the beets to skillet with sauteed veggies. Turn heat down to med/low and cook about 5 minutes. Once meat is tender, add potatoes and cabbage. (If you like the cabbage a bit crunchier, add about 5 minutes after potatoes are added.) Cook 15 minutes. Transfer all of the ingredients from the skillet to the pot. Add vinegar, sugar, salt, pepper, bay leaves, parsley and dill. Cook another 5-10 minutes or until potatoes and cabbage are tender. Taste if additional seasonings are needed. Add fresh herbs of choice. Ahh, Olga. I’m sooo sorry, what a bummer. Lots of things could have caused that. The size of your potatoes and cabbage, the temp you cooked the meat, etc. Did you add the leftover water from the beets? I’ve only had wonderful reviews with this recipe. Sorry no one liked your hard work:/.. Thanks for your reply!!! I’m from Chernivtsi . How about you? Where were you born? Hi Valentina! Thank you for this recipe! I live in Ukraine and we have 9% vinegar only, not 5%. Could you tell me please how much 9% vinegar i need for this recipe. Thanks!!!! So tasty!!! Thanks!!! If i don’t have fresh tomatoes, what can i use instead? Tomato sauce or ketchup? How many spoons? Hhhmmm, I think you should be fine substituting with like 3 tablespoons of tomato sauce, but I’ve never tried it so you may need a little more. Canned diced tomatoes will work as well if you have it. I hope you guys LOVE it:).. So, I made borscht last night! It’s indescribably good ? ?probably the best tasting borscht that I’ve ever made in my life!! the color, the flavors…hmmmm!! It’s definitely a keeper! From now on I’m just gonna use your recipe!! Thank you! I was also wondering, the other day my husband got bunch of chicken breast and chicken thighs that were on sale, can I use chicken meat for borscht? Since chicken cooks quickly I will have to throw it in at the same time when I throw potatoes and cabbage, correct? Also, there were quite some water leftover from the beets, that completely covered the зажарка, is that how it’s suppose to be? Because in the photos it looked like it barely covered the зажарка. Oh my Innochka, what a sweet comment, totally made me blush. Also, have you ever tried this Simple Russian Soup with seasoned chicken. Oh it will become a FAVORITE in your home, you are really able to taste home much of a difference seasoning your meat makes. Wow! This is different.. I’ve never heard of seasoning the meat for borscht. My aunt tried this recipe and said her family couldn’t get enough of it. Will have to try making it as soon as we finish our soup.. I’ve also never used vinegar when making borscht, my mama always used freshly squeezed lime juice and that’s what I’ve been using too. So happy to hear your aunt approved. Puts a huge smile on my face ☺☺.. My parents grew up in a very poor village in Ukraine. So my mom did not have lemons to use, and she used vinegar instead. That is such a fond memory to me and that’s why I kept it that way instead of the lemons (either can be used). I’m telling you what, once you try seasoned meat and the amount of flavor they have, you will never turn back. ?? Sweetie, thank you so very much for this borscht recipe!! This is my dream recipe, I have tried similar in Russian store and wanted to know how they did it but had no luck! It did took me a while since I followed step by step but so worth it!! The only thing I used my regular spoon and a little overdid on sugar:) but still delicious! May God bless you and keep those wonderful recipes coming! Love your taste!! Tatyana, what a beautiful comment. I love that feeling of when you finally find that wonderful recipe you were searching for.. ☺☺ So glad yo hear you approved. Next time you make it, it’ll be so much easier?. The best borscht ever!!! Thank you, Valentina!!! Will it be still good with a green bell pepper? Mmmm… this looks delicious. I want some now! Question: do you add all of the “leftover beet water” to the pan?